Membership websites are a goldmine when setting up well. They are a form of a business website that gives subscribers access to premium content. The site owners can hide such content behind a paywall to access by those with the ‘keys.’ Full-fledged membership sites have multiple membership levels. Streamlining all processes of such a business can prove difficult without the right tools. Thankfully, WordPress offers extended functionality with thousands of plugins. Whether free or paid, plugins make it easy for online business owners to get around the developmental costs and hurdles. One such plugin that is particularly useful to membership site owners is MemberPress. In this post, we look at what makes MemberPress popular and if it’s worth the price. MemberPress is a WordPress that allows users to create membership websites. Users can sell downloads, charge for products and services, sell site content, drip content as well as manage recurring payments. MemberPress gives users the ability to create, manage and analyze digital products and subscriptions. You can also grant or revoke access to certain pages, feeds, communities, posts, digital files, and categories based on level of subscription. Memberpress is a membership plugin that’s built on top of WordPress. As such, users can create full powered membership sites while leveraging all features of WordPress including plugins for forums, content management and communities. Depending on the license purchased, MemberPress can be installed on client websites. The clients can consult you for support, and you get in touch with us if necessary. Also worth noting is that should the license expire, your membership website doesn’t stop working. You are directed to the plugin section after activating MemberPress. This is where you can configure options for emails, accounts, pages, payments and more. Options available under the pages tab include create membership slugs, customize reserved pages, as well as monitor unauthorized access options. MemberPress automatically creates reserved pages, which are crucial for membership sites. You can configure member information under the Account tab. There are four sections including registration, permissions, logins and logins. You can also customize the account page welcome message. The Fields tab is where you enable and disable fields. You can also configure fields on user account pages and membership registration forms. Go to the Payment tab to configure payment methods, and choose whether you want show payment labels, descriptions and icons. You’ll find a whole set of options under the Email tab including which emails to send and when. The Marketing tab allows you to configure manage email accounts as well as mailing lists. MemberPress supports more than 10 email marketing integrations, making it easy to sync and add email addresses to mailing lists. The Info tab offers options to manage and edit business address while the General allows you to choose internalization, SEO, Paywall and theme compatibility options. MemberPress is big on content protection. Users can protect posts, tags files, pages, widgets custom post types and categories. In addition, the access rules are set up in a manner that makes it easy to use content for multiple membership products. There are multiple options for protecting content with MemberPress. You can protect a single post, all posts, a single page, posts in a certain category, children pages, tagged posts, all or some pages, custom post types etc. All MemberPress packages come with unlimited members and membership levels. Depending on the specified rules, subscribers can have multiple memberships at a time. This is a huge bonus that is not offered by most membership plugins. It is also quite beneficial for websites that offer many membership products or courses. MemberPress makes it possible for users to group products, which comes handy when creating upgrade or downgrade paths such as Free, Basic and Premium. This is particularly beneficial for those who offer multiple membership levels. Auto creation of pricing tables for insertion into the sales page is also possible with this feature. Simply specify the features to show on the pricing table when creating membership levels. There are two ways of dripping out content i.e. on a fixed date or registration date. This is a great feature for those offering courses. Members can get access as soon as they pay for courses, and lose access after the content expiration date. You can also allow subscribers to pause and continue their membership with MemberPress. This keeps those who would want to cancel their subscriptions because they’ll be busy for a few months. MemberPress makes it easy to automate pro-rate upgrades if that’s what you wants. This means that your members can upgrade from a Basic to Premium package. The system adjusts the membership cost accordingly after taking into account the existing payment or plan. These are a crucial addition to any membership website. They help keep members from unsubscribing. MemberPress allows you to send reminder emails in case of a membership expiration, failed attempt to sign up or renewals, thus getting subscribers back to your site. MemberPress supports over 40 integrations including email marketing services, forum software, payment gateways, and forums just to name a few. These third-party services make the plugin more useful than ever, and most of them are packed in as add-ons. You can access more than 20 of them under the Add-ons tab. Installation is easy with a single click, and so is configuring the add-ons. Simply install the add-ons you need to keep the dashboard tidy. This is one of the best features offered by MemberPress, and for good reasons. It allows membership website owners to create as many coupons as they want. Users can also customize codes used, number of times a coupon can be used and the expiration dates for coupons. Additional options include creating offers on existing memberships, overriding trial periods and applying discounts to the first payments. MemberPress is a way that makes it usable with almost any theme or framework. Developers can integrate their own code, hence plenty of room for customizations. Activating the Developer Tools add-on will allow one to pass on API notifications and webhooks, both of which aren’t available with the basic plan. MemberPress offers a taxes option that allows users to calculate tax rates for different members. This is particularly helpful when it comes to automatic geo-location. It also helps with the recently implemented EU VAT law. MemberPress is specially designed for users with limited knowledge of WordPress. It makes it easy to set up different sections of a membership website without worrying about shortcodes. After activating the plugin, you are directed to the options page where you configure different settings. MemberPress even offers the option to create pages automatically. There is an attached edit button for editing membership pages from the setup page. For most of the features, all you have to do is click on a box to turn them on and vice versa. MemberPress supports Stripe, which is one of the most reliable and convenient methods for getting paid with embedded credit card checkout. It comes handy for developers and online business owners. Stripe is currently available in more than 23 countries and keeps expanding its wings. In addition to accepting payments debit cards, Stripe makes it easy for users in any country to receive payment. When it comes to promoting search engine optimization, MemberPress makes things simpler. The plugin allows you to authorize access to membership protected content by search engines. This helps Google ascertain ownership of such content, which could improve your site ranking. MemberPress also handles proration i.e. letting members pay for the days they use the service. This is a huge bonus, considering how hard it is to find a plugin that handles proration. For instance, MemberPress charges for the remaining days if a user changes their subscription before the month ends. This is unlike other plugins where members are charged for a full month, regardless of when they change their plan. MemberPress supports advanced reporting add-ons, making it easy for users to track performance of their membership websites. The reporting module makes it easy to generate periodic reports. You can calculate multiple key indicators of performance including failed transactions, pending transactions, amount collected, amount refunded, completed transactions, refunded transactions, taxes collected and total net income. MemberPress offers a free affiliate program with the Developers plan. This allows users to boost sales and drive increased traffic to their membership site. Support for the Affiliate Royale plugin developed by Blair Willimas is also available. The plugin works well with MemberPress, turning WordPress into a powerful affiliate site. There is no need to customize the overall look of your membership website because the plugin works well with all themes. This is not to say that MemberPress doesn’t leave a lot of room for customization, if necessary, you can enlist the help of a developer or use tools like CSS to personalize the site. MembersPress makes it easy for site owners and members to manage subscriptions. Rather than leave everything to users to handle cancel, create, upgrade, or update subscriptions, this plugin allows members to do all of the above on their own. Easy to setup: This is one of the main reasons why MemberPress is such a popular membership plugin. As with most plugins, MemberPress installs with a single click. Taking care of prerequisites such as creating pricing tables, login pages and thank you pages isn’t hard either. Most of these are handled automatically. Controlled access to premium content: MemberPress leverages advanced access rules that ensure only paid members have access to content. You can protect content based on categories, children pages, custom post types, standalone files etc. And as your site becomes more sophisticated, so do the access rules. Plenty of customization options: Because everyone has different needs for their content and style preferences, the need for customization is high. MemberPress makes it easy to customize sign up/in pages, thank you messages, account pages etc. Access to filters and add-ons offers even more room for customization. Advanced users with an understanding of programming can allow their subscribers to buy coupons for use by someone else. Integration with payment gateways: MemberPress supports three main payment gateways i.e. PayPal, Stripe and Authorize.net. While it may seem like a few, it is certainly a relieve to know that the plugin supports gateways that are more secure and PCI compliant. Users can charge credit cards and issue automatic recurring payments. Integration with third party services: MemberPress integrates with multiple third-party tools including email marketing services that make it easy to stay connected to subscribers. Supported services include GetResponse, MailChimp, MaidMimi and Aweber. If you need to post podcasts, you can access Blueberry via MemberPress. This allows you to streamline podcast publishing workflow while making your podcast accessible to subscribers on the platform. Premium community forums: Users can build password-protected forums. This is because MemberPress supports integration for forum plugins like BBPress. Easy to run promotions: Running promotions and giveaways are a must for any business that wants to boost sales. MemberPress makes things easy by allowing you to generate as many coupons as needed. You also get control over the expiration date, number of uses, coupon codes and more. Great pricing packages: MemberPress allows users to set up pricing packages, sort the order of the products, change look and feel, as well as assign content to each of the packages. 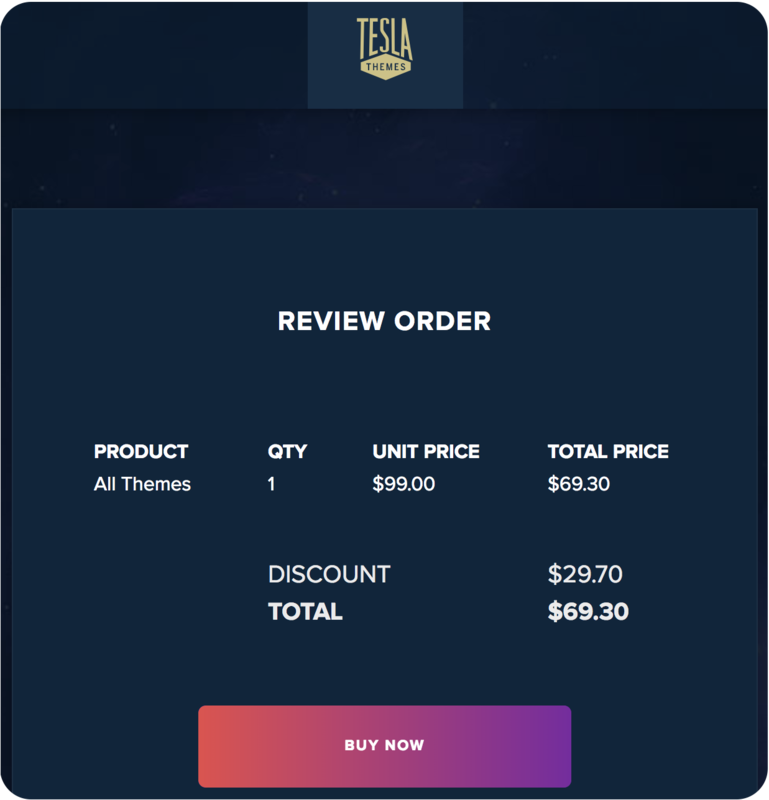 You can choose from a variety of pricing page themes to customize the pricing page or create a custom one with CSS if you have the skills. Ultra stable and secure: Caseproof is credited for writing multiple plugins including MemberPress, Affiliate Royale and Link Pro. This particular is built from scratch with superior coding practices to ensure WordPress stability and security. Unwavering support: Getting your WordPress site up and running with MemberPress is easy. The plugin offers a user manual and a support team is always available to help. Full featured membership plugin: MemberPress does everything from protecting and hosting exclusive content to email management and extensive reporting. Few payment gateways: The only downside of MemberPress is that it doesn’t integrate with a lot of payment gateways. This makes it difficult for customers in certain countries to receive payment. MemberPress offers multiple pricing plans to suit different needs i.e. Basic, Plus and Pro. Basic ($129/Year): This is designed for beginners who are setting up their first membership website. Features offers include use on 1 site, unlimited members and content, support for PayPal and Stripe, 10+ add-ons and integrations as well as 1-year of support and updates. Plus ($249/Year): This is a great plan for entrepreneurs, small businesses and freelancers. In addition to all Basic features, you get use on 5 sites, sell corporate accounts, work with Authorize.net and 10 additional add-ons and integrations. Pro ($349/Year): This plan is designed for advanced membership sites and anyone who wants to drive better results. Features offered include 25 websites limit, Affiliate Royale support and exclusive Pro add-ons. Plus is the most popular plan, probably because it offers a good balance between cost and features. For someone who wants to refine an existing membership site, the Plus and Pro plans are the best. MemberPress offers a 100% money back guarantee for fourteen days. It is also worth noting that the plugin offers business and developer versions, which cost $99/Year and $199/Year respectively. MemberPress is heavily invested in ensuring customers get the support they need to run a membership site business. It offers multiple types of support including a knowledge base that covers different topics to help get started, learn more about advanced features and troubleshoot issues that may arise. Customers with an active subscription can submit a support ticket from the Premium Support Request Page at any time. The support team responds within 24-48 hours. Also included is a frequently asked questions (FAQ) section. Should I get MemberPress? Absolutely. It should be the first plugin to consider when building a membership website. It generates front-end login and account pages to improve user experience. Changing user journey based on subscription plans is easy, and the user experience seamless. The plugin makes it easy for you and your subscribers to manage accounts, thus cutting down on any support issues. The addition of third-party integrations allows you to handle things like email marketing, affiliate marketing and payments without having to leave WordPress. There is also an excellent reporting system that makes it easy to track performance of membership website. While there is no one-size-fits-all solution, MemberPress is a much better option than most membership plugins. This is largely due to high quality coding and unlike other plugins, doesn’t provide too many features that you don’t need. At a minimum cost of $129/Year MemberPress offers incredible features without leaving a hole in your pocket. Founded in 2006 in Sidney, Australia, Envato runs an ecosystem formed by different marketplaces; Envato Market is designed to help people from around the world to buy and sell creative assets and consists of eight different products. It has more than 1.5 million active buyers, more than 6 million community members, and over 9 million products available for sale. Born as part of this ecosystem comes ThemeForest, their largest marketplace, where you can purchase and sell HTML templates. They also offer CMS-based themes for popular platforms such as WordPress, Joomla, Drupal, Magento, and others. ThemeForest is basically a community of web designers and web developers. All items available for sale are listed and priced based on their overall complexity, quality, and usability. The price you pay to the item’s author also comes with a Buyer’s Fee from Envato. What this means is that you get access to all their services, such as 24/7 customer service, fraud protection and quality control for all the items listed. By creating an account and signing up to ThemeForest (or any other marketplace for that matter), you also get full access to the entire Envato Market network. ThemeForest is divided into several categories where you can choose your items from, WordPress and HTML contents are definitely the most popular ones, but they also have templates and themes for marketing, CMS, eCommerce, PSD, Ghost Themes, Layers WP, Muse, Plugins, Tumblr, Facebook and much more. Before any item is listed as available for purchase it is thoroughly reviewed by the Envato review team. And these guys are tough. They only work with the best freelance developers out there to ensure top-notch quality on all their products. Additionally, you can also contact the item developer directly for customized alterations. All users can also take advantage of the Envato Market API. Whenever someone creates new content, they are protected by legal rights over those creations and they can’t be used or distributed without the author’s permission. So whenever you purchase an item from the ThemeForest marketplace, you are also buying a license to use it, and here is how. Most of the items available for web content are covered by the Standard License, which divides into Regular and Extended. The main difference between the two is basically that under the Regular License, the end product is distributed free of charge, and under the Extended License, it can be sold. Other types of licenses include Music, SFX, Video, Photography, and Specialties (which covers tools like add-ons and fonts, logos, and t-shirts). ThemeForest is most likely the cheapest source of creative content available on the net. You can find WordPress themes for as low as US$ 30 and if you’re lucky, you’ll catch some of their bundle offers which offer great value to the consumer. These bundles usually include items listed in different marketplaces so when you purchase one, you get web content, graphics, audio, video, plugins, you name it. Signing up is 100% free and in doing so, you get full access to all eight Envato marketplaces and you can start buying items immediately. You can also take advantage of the support forums and contact developers directly. 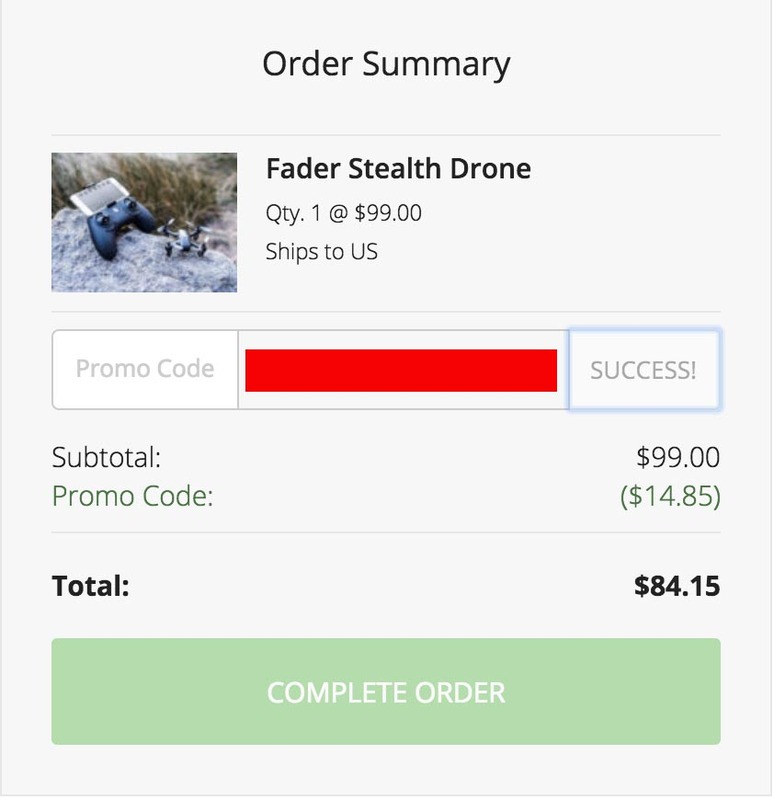 To make a purchase is quite simple, just add your desired items to the cart, and pay for them using PayPal or your Pre-Paid Envato Credit Line, then download your content and that’s it. Smooth and easy. The Help Center or FAQs: Here you can find answers related to the platform, user accounts, buying and selling, intellectual property, taxes, and pretty much everything else on the site. Available 24/7. Forums: All members get full access to the user forums, where you can ask questions to topics not covered on the Help Center and interact with other users as well. Some developers have their own threads, so you can contact them directly for customer support. Theme Documentation: All items are required to have documentation readily available to all costumes. Theme Discussion Section: All items also have a discussion area, so you can post your comments, compliments, and issues and address them directly to the developer. So whether offline or online, at ThemeForest you can be sure you’ll get the care and support you deserve. Arguably the largest marketplace of its kind, ThemeForest has it all. The platform has a very friendly interface, and you can find all the items you need by using many different search filters. By being free to sign up, all users get additional value by getting full access to all eight marketplaces. And with unrivaled product quality by the world’s best, high-end developers, tough-to-beat prices and outstanding community support, at ThemeForest you can find everything you will ever as a web developer, designer or programmer. In the information age, companies with attractive and informative websites are drawing in potential customers and clients. This implies that; an individual or firm with a message to pass must go through the process of choosing a web hosting service and eventually setting up a website. To get the best web hosting services means to try and maintain a balance between three essential things: the right features, capacity, and cost. Several options exist for one to choose from with the key question being; which is the best web hosting service to suit your personal preferences? Both from a technical and business perspective. Web hosting services are classified into three major plans: shared hosting, Virtual Private Server (VPS) cloud hosting and dedicated hosting services. The Shared Hosting Services: These are the most basic of a web hosting plan. On a shared web hosting platform, your website will reside on a server alongside other websites. This feature, as the name suggests, means that you get to share the server space and other resources such as the memory and processor with other websites. Shared hosting services can have a direct impact on your website performance, say for example; a given website connected to the same server starts experiencing a high traffic load, this will, in turn, affect the speed of your website. The main advantage that shared hosting services have in the market is that they are the cheapest in the market. They are especially suited for small enterprises’ users such as bloggers, small internet based shops, or a combination of these. The VPS Cloud Server Web Hosting Services: On these web hosting services, you share a server with other websites but get your own specific allocation of resources. Given the allocation, there are minimal chances that another website will affect your traffic. The Dedicated Server Web Hosting Services: On these web hosting services, you get your own server and as additional benefits the maximum possible allocation of space and performance. Despite being the most expensive in the market, dedicated web hosting services deliver the most benefits to users. Choosing the best web hosting service provider needs a lot of research. In this article we look at the SiteGround; a quality web hosting service provider. We review the services provided against the above framework. SiteGround, a privately owned company, was founded in the year 2004 by a small group of IT professionals who also happened to be campus friends. It has grown into a leading web hosting service provider. Today the company has more than 280 employees and counting. SiteGround processes in excess of 1500 tickets, 800 phone calls, and 2000 chat requests per day. It hosts more than 450,000 domains and the number keeps growing, adding to their already impressive portfolio. Service hosting including Email hosting, FTP hosting, PHP hosting, MySQL hosting, cPanel hosting. Applications hosting including: WordPress hosting, Joomla hosting, Magento hosting, Drupal hosting, and PrestaShop hosting. Templates including: Joomla templates, WordPress themes, and Magento themes. Maintaining top data centres across three continents. The data centres ensure servers have geographical proximity to ensure great speed, connectivity, and reduction of redundancy. Handpicking server technology and setup. Having a unique software optimization capability only means that SiteGround can deliver a hosting environment better than their closest competitors. 99.996% server uptime all year round. This is achieved through the dedicated care by system administration teams and a unique software that minimize system downtime. Dedicated support structure with 24-hour access, 7 days a week. SiteGrounds’ shared hosting services are specially crafted for the superior experience. Divided further into three main payment plans with a range of features, and a discount price on sign up. The payment plans at the very minimum offer the user: an easy signup and start, 99.9% server uptime, great technical support, easy to use tools for both Joomla and WordPress, and a friendly user interface. In addition to the shared hosting services, SiteGround also runs cloud hosting services. Based on an ultra-modern, innovative technology, the cloud hosting services is ultrafast, auto scalable, and gives room for user customization. It also comes with 24 hours support 7 days a week. The SiteGround cloud hosting service is further divided into four payment plans of Entry, Business, Business Plus, and Enterprise. The cloud hosting services also give you the option to create your own customized plan. SiteGrounds’ dedicated server hosting services are a premium range of managed servers. These servers are set up and managed by experts, and in addition, the user gets access to a highly proprietary software to boost server performance and give you more functionality than anybody else. The dedicated server services are divided into three main plans including The entry server, the Power Server, and the Enterprise Server. The user also gets the option of choosing the data location of his server. SiteGround also supports web designers and developers who maintain their customer websites on a long-term basis. It aims to include a highly reliable web hosting service as part of the offering. Resellers who opt for this service take advantage of offerings including volume discount on hosting, special domain names deals, and great profit-making opportunities. A minimum 10, 000 monthly visits. A minimum 10GB web space. A minimum one website hosted. Free site setup and/or transfer. Unlimited sub and parked domains. Free CDN with each account. My SQL on different disk. Basic backup and restore services on GrowBig and GoGeek plans. Support services via phone, chat, and tickets. Multiple PHP versions (7.0, 5.6, 5.5, and 7 more). SiteGround shared hosting services is divided into three main payment plans: StartUp, GrowBig, and GoGeek. 10,000 average recommended site visits. 20,000 average recommended site visits. 100,000 average recommended site visits. SiteGrounds’ cloud hosting services are divided into four main payment plans with an option of creating your own customized plan. SiteGrounds’ dedicated hosting services are divided into three main payment plans. 3.20 GHz CPU clock speed. 3.50 GHz CPU Clock Speed. 2.00 GHz CPU Clock Speed. 2 * 6 CPU Cores. 2 * 12 CPU Threads. 4*500 GB SATA III / RAID 10 HDD. The StartUp plan is priced at $9.95 monthly. On first time purchase, it comes with a 60% discount. The user is thus charged an offer price of $3.95 for the first month of use. 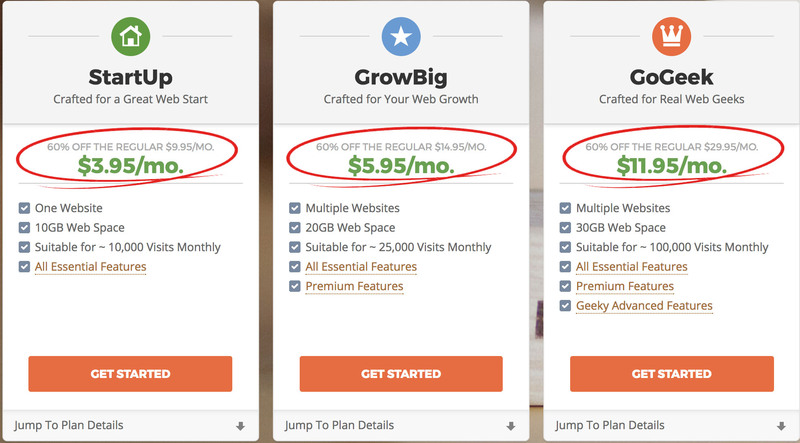 The GrowBig plan is priced at $14.95 monthly. On first time purchase, it comes with a 45% discount. The user is thus charged an offer price of $7.95 for the first month of use. The GoGeek plan is priced at $29.95 monthly. On first time purchase, it comes with a 40% discount. The user is thus charged an offer price of $14.95 for the first month of use. The Entry plan is priced at $60.00 monthly. The Business plan is priced at $80.00 monthly. The Business Plus plan is priced at $100.00 monthly. The Enterprise plan is priced at $140.00 monthly. The Entry server is priced at $229.00 per month. 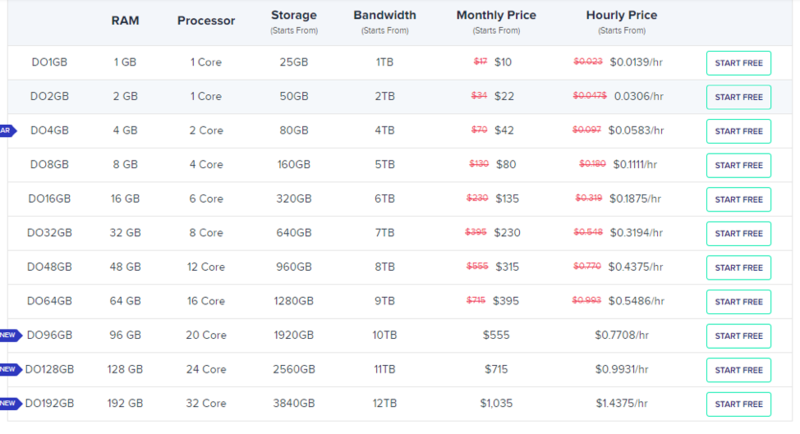 The Power server is priced at $329.00 per month. The Enterprise serves is priced at $429.00 per month. The reseller hosting services are priced on a variable basis but go as low as $42 per year. SiteGround has a unique approach to achieving the highest possible uptime. A lot of emphases is placed on the choice of data centres and winning over the dedication of system administration teams. SiteGround has also developed unique software for downtime minimization. This software monitors the real-time status of servers in addition to resolving over 90% of server issues without any human intervention. In the past year, SiteGround servers recorded a 99.996% uptime. In the last 30 days, the servers recorded a 99.999% uptime. When compared to other servers in the market, SiteGround servers had a significant advantage in terms of performance. The time taken by the servers in two critical stages of detection and reaction was almost zero. The other servers recorded times varying up to 20 minutes in each of the stages resulting in significant downtime. Technical support is provided 24 hours a day, seven days a week. Support is provided through multiple platforms including the phone, chat and a ticketing system. To ensure better customer service, SiteGround pursues a policy of zero on hold time on the phone and on live chat. Tickets take an average of 10 minutes response time. The technical support team at SiteGround pride themselves in their advance knowledge of the systems. They are always willing to go the extra mile to sort your problems. It is of little surprise that review on varied platforms speaks highly of the support team at SiteGround. Money Back Guarantee: SiteGrounds’ 30 days money back guarantee to give you the peace of mind that services will meet your expectations. Examples of money back guarantees provided are: for service termination, and significant downtime greater the 0.1% year round. Though you came here by searching sitegorund coupon code. But to be honest and frankly speaking there is no coupon code available for sitegorund. Let me clarify why… Since I’m using sitegorund I know the there’s to coupon field in the whole check out process where you can enter the coupon to get the discount. But nothing to worry about we’ve something very special for you to offer; that is a special sitegorund discount link which will give flat 60% off of any web hosting plans you want to buy from them. It’s very beginning of the post if you wish you can check that out. SiteGround web hosting services is the better option when making that critical choice between a variety of competing for web hosting services. They have excellent customer support, significant uptime averaging 99.9%, and a well-designed user interface to manage all aspects of an account. All domain, billing, and ticket issues can be handled through the user interface provide the advantages of a one-stop management, beautiful interactive design, and the best hosting control panel.